them, mating, laying eggs, radiating in ever changing colors, darting here and there, and being eaten by every predatory beast in the ocean. Crabs feasted, tearing apart the dying bodies of the squid which had spawned (the species off California dies after spawning). Phalanxes of bull nosed rays flew through the breeding melee in squadron-like formations gorging as they went Random blue sharks swam by with squid bodies and pieces dribbling from their overstuffed jaws. It was a giant seafood festival as every other fish in the vicinity joined the feast. This spawning mass was a sight never to be forgotten, and for mc it was the mental beginning of this book. And so this book was actually born. 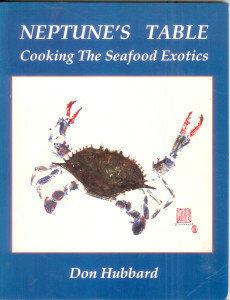 I amassed squid recipes from sources from Maine to California and cataloged them for my publication. But there was one flaw. I didn’t think that a squid cookbook would fly, so I added another exotic – octopus. Still not broad enough! Then I made the fateful decision to write a whole cookbook on shell-fish. Ouch! That led to 18 months of non-stop cooking, eating, trying, adjusting and finally accepting the some 215 recipes in this book out of about 400+ cooked. Further, I practice a Japanese art named GYOTAKU, or Fish Printing, and decided to liven thing up by producing a separate, original, GYOTAKU for every chapter Lastly, I added a bit of information about my personal involvement in the collection of the raw materials in my world-wide travels. And that is the book you see on this page. I contains 166 pages of tested and approve shell fish recipes, original art work and interesting shell-fish collecting memories.. Buy a copy and enjoy.